Caring. Personal attention. Guidance through your legal odyssey. At Bogaards Law, you will feel what it is like to be given personal attention and guidance throughout the legal process. We want you to be happy. It’s our job to focus on the details and provide you with a successful outcome. Bogaards Law will be detailed, thorough, organized and focused on the facts of your case. Bogaards Law will listen to you, understand your position, and provide thoughtful advice. "Debra is a STRONG ADVOCATE and an excellent person to have on your side. She took the time to listen to me, understand my position, and provided careful and thoughtful advice. She helped me reach a favorable outcome in my case and I will be forever GRATEFUL." "Debra helped us navigate an incredibly tense and difficult situation. Her approach was just what we needed. We found Debra to be caring and understanding of our case, while being a fierce and determined advocate. Debra moved swiftly, took just the right amount of control, and definitely went the extra mile for us. I really felt like we had the upper hand. I was so glad Debra was on our side and not theirs! We were ultimately successful, and we have Debra to thank for it." San Francisco trial attorney Debra F. Bogaards of Bogaards Law, a San Francisco-based law firm, specializes in personal injury, wrongful death, elder abuse, nursing home neglect, and employment, as well as victims of PG&E pipeline explosions and fires. 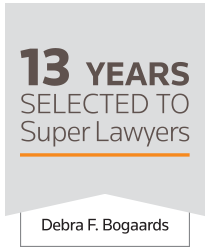 Bay Area lawyer Debra F. Bogaards practices law throughout California, northern California, the San Francisco Bay Area, the North Bay, East Bay, South Bay and San Francisco, Marin, Sonoma, Napa, Alameda, Contra Costa, San Mateo, Santa Clara, Mendocino and Humboldt counties, as well as Santa Rosa, Sacramento, Oakland and San Jose.